Josh Moffett and Stephen Thornton have arrived into service with an eight-second lead at the Trailer Parts & Spares Lakeland Stages Rally, round five of the McGrady Insurance MSA N.I. Rally Championship! 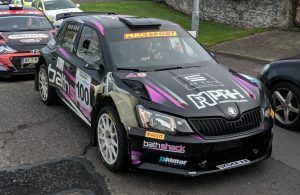 The Monaghan driver has kept his nose clean over the opening three stages while a number of his rivals have fallen by the wayside. They include Barry McKenna whose Fiesta left the road on the opening stage shortly after hitting a chicane, while Andrew Purcell dropped vital seconds on that first test with some chicane bashing of his own. There were no such troubles for Josh Moffett who has set fastest or joint-fastest times on every stage so far. 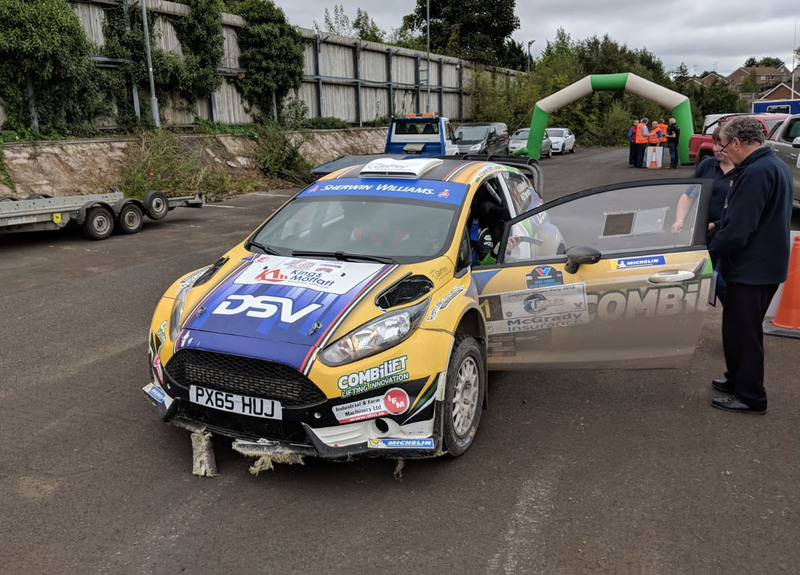 Vivian Hamill and Andrew Grennan are ecstatic to be second overall in what is only their second event with a Ford Fiesta R5. Cathan McCourt and Barry McNulty are third overall despite a “big moment” when they lost around 10 seconds at the infamous square left that follows a jump on the ‘Ballintempo’ stage three. Desi Henry and Liam Moynihan are the leading McGrady Insurance N.I. Championship contenders in fourth overall. Henry has enjoyed a solid run so far but admits that he’s getting used to driving on gravel again. Meanwhile, N.I. Championship leader, Derek McGarrity, is at the bottom half of the top 10 having been surprised by some of the tight stage three chicanes. Alan Smyth commented earlier that he had some handling problems with his Evo X but he has since discovered that the car isn’t the problem – the driver is! Alan Carmichael is having a difficult day in his Mini WRC with mechanical troubles followed by a puncture on stage three. Stephen McCann admitted that he’s “not really used to such a loose surface” but is doing his best and trying to learn. As for Marty McKenna, it’s his first event in four years and he’s in a left-hand drive Fiesta WRC, so it’s all proving to be a baptism of fire…but he’s smiling! 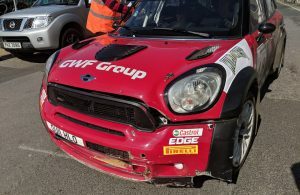 Niall McGonigle was sporting some damage to the front of his Evo after a heavy landing on stage one. He was literally ‘flying’ after previous competitors through the stage demolished the two chicanes but he is in an impressive seventh overall. Organisers subsequently stopped stage one on safety grounds and are attempting to rebuild the chicanes in time for the second loop of stages. In the two-wheel-drive category, David Crossen is a man on a mission. Navigated by Aileen Kelly, the crew are ninth overall and are leading the category by almost 20 seconds, despite their car bottoming out on a few occasions. Frank Kelly and Sean Ferris are second among the 2WD crews in spite of a big overshoot on stage three. 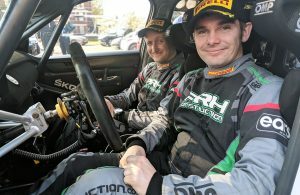 Shane McGirr said he was struggling to find traction on the loose surface while Oran Donnelly was in a ditch on stage one and he damaged a brake disc while trying to get back on the road. “We had a dodgy brake pedal for the rest of the loop,” Donnelly said. Crews are now getting ready to contest the final loop of stages before returning to the former Grosvenor Barracks site in Enniskillen where the Trailer Parts & Spares Lakeland Stages Rally winners will be crowned. Latest results are available from www.rallyscore.net. Next Story → Moffett Wins Lakeland Stages Rally Despite Last Minute Dramas!